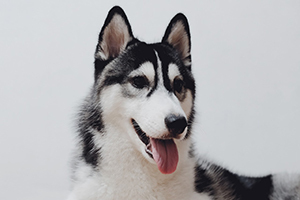 Alaskan Malamutes are beautiful dogs that have a long and illustrious history. Today, they're revered for their beauty and unique personalities. When most people encounter these dogs, they're immediately met with a playful attitude and affection. Alaskan Malamutes are much more work than most people realize. Malamutes are considered to be a natural breed. Humans had little impact on how these dogs have evolved over time. They weren't bred like other dog breeds. As a result, they have many traits that are more closely aligned with wild canines. This can make them a handful. Most owners will tell you that Alaskan Malamutes are not for beginners. If you're thinking about getting a Malamute puppy, you need to make sure that you're ready for the commitment. Here are some things you should know before you adopt. There's very little hard evidence available in regards to the history of Alaskan Malamutes. However, there are a lot of theories. One of the most common is that these dogs helped Eskimos journey across Siberia over 4,000 years ago. Since then, they've played important roles in many events. They were used heavily during the Gold Rush because of their strength and endurance. Shortly after that, the Alaskan Malamute Club of America was formed. Due to their natural classification, there's some contention between the two groups about breed standards. Today, Alaska Malamutes continue to work in cold environments. They also make great family pets to dedicated owners. Alaskan Malamutes are very large dogs. Giant Alaskan Malamute puppies will turn into giant adults that weigh between 60 and 100 pounds. One of their defining characteristics is their thick coat of fur. They have two separate coats. The undercoat is soft and insulating while the outer coat is coarse. Underneath all of that hair is a muscular body. They're incredibly powerful and have been used to pull sleds throughout history. They weren't used for speed. Instead, they were chosen because of their high endurance. Their bodies are built to withstand extreme temperatures and little food. The food that they do consume is burned off slowly so that they can continue to pull for miles. The face of an Alaskan Malamute looks very similar to that of a wolf. They have triangular ears that stand up when they're listening for something in the distance. When you look at a Malamute's paws, you may be surprised at their large size. Their big paws help them run through snow and mud with ease. Life expectancy for an Alaskan Malamute is about 10 years. However, some have been known to live a little longer with proper care. One common misconception that people have about Alaskan Malamutes is that they're part of the Siberian Husky family. Some people even mistakenly call the breed the Alaskan Husky. It's an easy mistake to make. They have a similar overall appearance, many of them have blue eyes, and they both have thick coats with distinct patterns. However, they're not the same dog. In fact, they're not even part of the same family. As mentioned earlier, Alaskan Malamutes are a natural breed and have remained relatively unchanged with human interaction. One of the most notable differences between the two breeds is size. 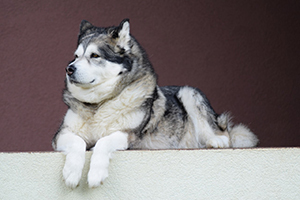 When you put the two together, you'll quickly realize that an Alaskan Malamute is much larger and more stocky. As a result, the two dogs are also used differently in working conditions. 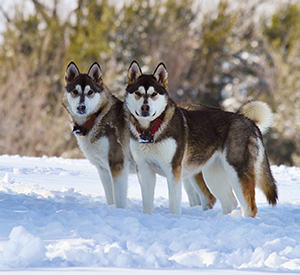 Siberian Huskies can pull light loads very fast across frozen environments. Malamutes, on the other hand, can carry massive loads. They were used to carry large freight. They do this by digging in the snow to move forward. Alaskan Malamutes do best in cold environments. They're sled dogs with thick double coats. They love to be outdoors and spend their time running through the snow. With that being said, they can live in warmer environments. The issue with warmer climates is that you're going to have to be careful about their health and well-being. ​Their coats are insulators. While we often associate insulation with cold weather, it works both ways. It keeps heat in and helps to regulate their body temperature regardless of what the weather is like outside. However, in hotter climates, they can overheat relatively quickly. You'll have to make sure that they always have access to shade and cool air conditioning. Many owners in hotter parts of the world wait until the early mornings and late evening to let them get some exercise. It's also important that you don't let them over-exert themselves. Otherwise, your dog may suffer. These dogs need to have mental and physical stimulation throughout the day. They have a natural instinct to work. If they don't have an outlet to get some of that pent-up energy out, they will start to destroy your home. With their large size, destructive behavior is not a minor issue. They can easily rip holes through your walls, tear up your sofa, and break furniture. If they stay outside, your yard can quickly turn into an excavated mess. To avoid this, you need to give your Alaskan Malamute dog plenty of things to do. Spend as much time with them as possible. They love attention. If you can't do that, they need to have something to stay entertained. It's a good idea to invest in toys, chewable treats, and anything else that can keep them occupied. Heavy training is also essential. In addition to destructive behavior, your dog may start to howl for your attention. To save yourself and your neighbors the headache, invest in some mental stimulation tools. Alaskan Malamutes have a very high prey drive. Animals big and small can easily become their focus of aggression. They've been known to go after cats and livestock. If the other animal starts running, Malamutes will give chase until they're caught. * With a dog of this size, the results can be gruesome. Some dogs don't even like the companionship of other dogs. Your pup's reaction to other animals will depend on their upbringing. It is possible for them to coexist with other pets. However, you must introduce them when your dog is just a puppy. Early socialization and training are key. You have to stay vigilant and put a stop to any signs of aggression towards other animals. Despite the issues some Malamutes will face with smaller critters, they absolutely love humans. Owning an Alaskan Malamute can be a joy if they are raised correctly. They're very easy to get along with due to their social nature. As a result, they make great family dogs. They thrive on social interaction and affection. Even with their intimidating appearance, these dogs love to cuddle. They do especially well with children. With that being said, you should never leave your Alaskan Malamute alone with children. This goes for all large breeds. While the chances of your dog attacking someone is slim, they're fully capable of doing so. 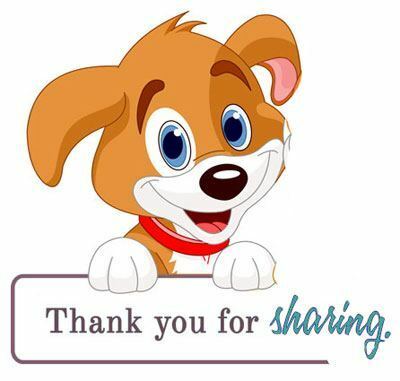 Never let a child surprise your dog and make sure that food is never thrown into the mix. Malamutes are notoriously territorial when it comes to food. Another important thing to be aware of when it comes to your Malamute's friendly temperament is their role as a guard dog. These dogs make awful guard dogs. Their ability to make friends with any human basically ensures that would-be burglars have free reign of your home. The best an Alaskan Malamute can do in terms of property protection is intimidate possible trespassers with their appearance. Alaskan Malamutes are very intelligent creatures. Sometimes, they're too intelligent for their own good. They have a similar way of thinking as Siberian Huskies do. They're largely independent and will decide whether or not your commands are worth doing or not. Some dogs have been known to test their owners right back. They may go through a cycle of training commands before they decide to do the thing you asked them to. With this trait, Malamute training can be a nightmare to newbies. You have to be tough and keep up with your training techniques. Otherwise, your dog will walk right over you. Obedience training needs to start as early as possible and continue throughout their lives. With other puppies, sliding on the rules won't have a drastic effect. With the Alaskan Malamute, you'll quickly find that doing so is a big mistake. Let your pooch slide one time and they'll learn to take advantage. it's important that you don't automatically assume that you're the alpha in the pack. You have to make yourself the alpha. This is why many novice owners have a hard time handling their Malamute. You need to establish your dominance during puppy training and hold onto it throughout your dog's life. As mentioned earlier, their intelligence and independence may lead to insubordination. If you don't take care of that issue as soon as possible, it can lead to some issues later on. Many owners use a unique method of training. Called respect training, these techniques help to establish dominance at a young age. Exercise is essential for keeping your Malamute healthy and happy. Alaskan Malamute puppies were born to work. They need the opportunity to use up their energy whenever possible. It's recommended that you create a large outdoor area for them to run and play. The space should be large enough for them to explore freely. However, it also needs to be fenced in. Alaskan Malamutes are great escape artists. They'll jump over short fences, break their way through weak locks, and dig to scratch their exploration itch. All of this behavior starts as a puppy. To keep them contained, you're going to need a high fence. It's recommended that you bury wire or brick underneath the fence line to deter digging. Like any other dog breed, Alaskan Malamutes puppies are susceptible to a host of health problems when they grow up. Their large size puts them at risk for a few different joint issues. One of the most common is hip dysplasia. This condition happens when the hip joints become malformed. It can lead to immense pain and cause lameness in their legs. One way to avoid this is to provide your pup with a balanced diet from the start. You can also give them joint supplements to ease the pain. Bloat is another thing to look out for. Malamutes are voracious eaters that will scarf down anything you put in front of them. They can take in too much air as their eating. This results in excess gas in their stomachs. Bloat occurs when the stomach twists and prevents gas from getting out. It can be fatal if it's not addressed in time. The best way to avoid this is to make sure that your puppy eats small meals slowly. They should also avoid physical activity for at least half an hour after eating. Malamutes can also get alopecia. This condition affects their hair. It's genetic and may start to affect them when they become an adult dog. Alopecia symptoms include increased hair loss and bald spots. Even with all of their great traits, Alaskan Malamutes puppies are not for everyone. These puppies can be very difficult to raise if you're not adequately prepared. While these dogs are highly sought-after across the world, they're also commonly abandoned. It's easy to find Alaskan Malamute puppies for sale. Novice owners will buy these pups due to their good looks and quickly find that they're more than they can handle. Many experienced owners rescue Malamutes from people who realized they were too much for them. Unfortunately, this type of abandonment can lead to significant issues. A lack of proper training can bring out the worst in Alaskan Malamute puppies. While Alaskan Malamute rescue dogs eventually find they're forever home with a capable owner, a lot of damage has already been done. These dogs then have to undergo significant retraining to become happy and healthy. Before you decide that you want an Alaskan Malamute puppy, it's important that you take the time to think things over. Malamute puppies are a big commitment. You have to put in a lot of time and effort into raising them. If you do think that you're up for the challenge, stick to your training regime and provide your pup with plenty of love. If you do things right, your Alaskan Malamute will be a happy and loving part of your pack.